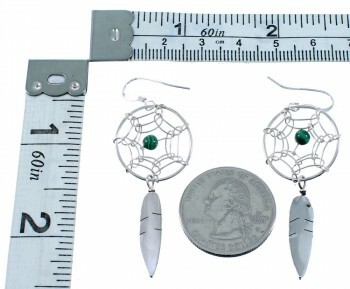 Hook dangle earrings measure approximately 2-1/4" long (including hook) and 3/4" at widest point. This magnificent and traditional pair of earrings represents the finest of Navajo craftsmanship! This piece of Native American jewelry is Navajo hand crafted by artist Lorenzo Arviso, out of genuine sterling silver and a real Malachite bead. The bead is placed in the center of a silver web design, while a beautiful silver feather dangles at the end of each earring for a gorgeous finish. 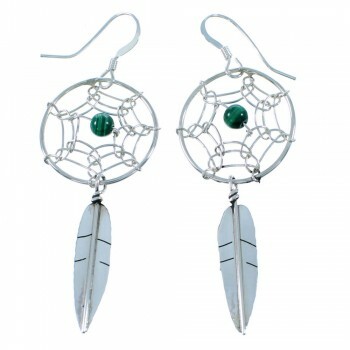 It is believed that each carefully woven web will catch your bad dreams in the night. The bad spirit dreams will get caught in the web and disappear with the morning sun. However, the good spirit dreams will find their way to the center spirit hole and will float down the sacred feather. 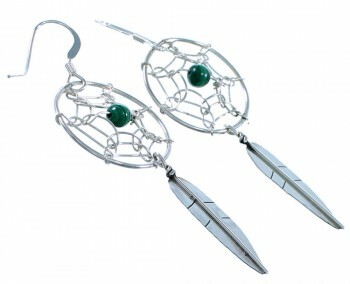 Feathers are symbols of prayers, marks of honor or sources of ideas. They represent the Creative Force.